Windows 8 have an improved Task manager, the application are listed independently so the users can see the statistic like CPU usage, memory, and also performance. 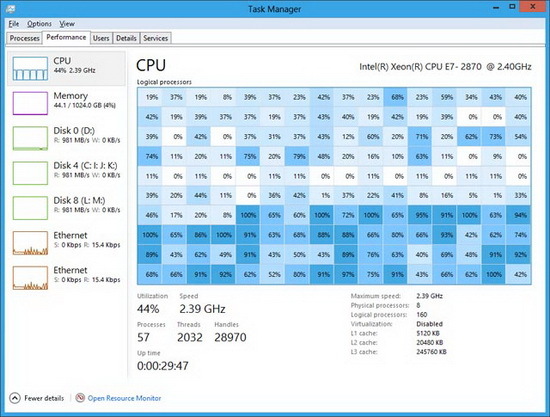 Compared to Windows 7, Task Manager on Windows 8 is much better and have some privilege which not available on Windows 7. On windows 7, we can see the performance of process with a small tool called task manager. 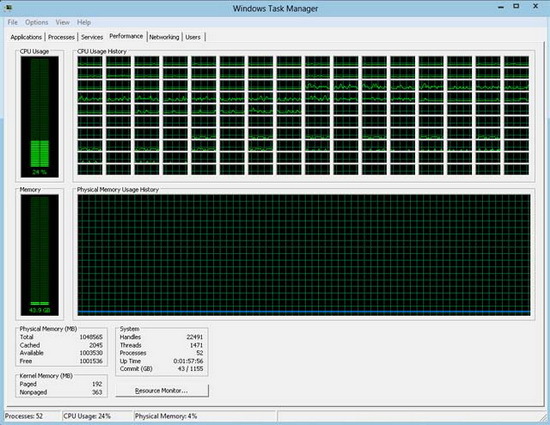 The maximum total core processor which can be monitored with task manager is around 160 processors. But on task manager on windows 7, there are some limitations especially to know the burden of each core. On windows 8, these problems have been solved by changing the interface into a better one. This thing can be seen on the image below. On the image, we can see that each core represented by small cubicle with the explanation about the burned which being done (presented in percentage <%>). To see the detailed explanation about the jobs burden, user only need to move the cursor to the core box.